Sister Faustina was a young, uneducated, nun in a convent of the Congregation of Sisters of Our Lady of Mercy in Cracow, Poland during the 1930’s. She came from a very poor family that struggled on their little farm during the years of World War I. She had only three years of very simple education, so hers were the humblest tasks in the convent, usually in the kitchen or garden. However, she received extraordinary revelations or messages from Our Lord Jesus. Jesus asked Sr. Faustina to record these experiences, which she compiled in notebooks. These notebooks are known today as the Diary of Saint Maria Faustina Kowalskaand the words contained within are God’s loving message of Divine Mercy. 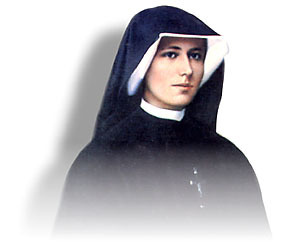 Today, we continue to rely of Saint Faustina as a constant reminder of the message to trust in Jesus’ endless mercy, and to live life mercifully toward others. We also turn to her in prayer and request her intercession to our merciful Savior on our behalf.